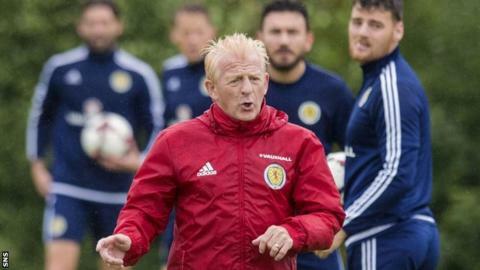 Scotland coach Gordon Strachan believes there is "added confidence" within his squad after their past two World Cup qualifiers. The Scots drew 2-2 with England in June after beating Slovenia 1-0 in March. "We've always had the belief, but the extra bit of confidence helps with that belief," said Strachan, whose side visit Lithuania on Friday. "You wouldn't have had the performances like we did in the last couple of games if you didn't have that belief." Who will Strachan pick for Lithuania? Strachan insists neither he nor his players are "fazed" at having to play Lithuania on the LFF Stadium's artificial turf. "It's not too big a problem," he said. "We've known for a long time that we were going to play on a surface that we're not used to. Some have played on surfaces like this, some have never played on it. "We'll be working on a surface similar tomorrow afternoon. "[Assistant coach] Callum [Davidson] has been out there with St Johnstone so that's very handy." And Strachan described the notion that there is a greater likelihood of injuries on artificial pitches as "a myth". Midfielder Matt Ritchie has indicated Scotland need to get "maximum points" from their final four World Cup qualifying matches. Strachan's Scotland, who also host Malta next Monday, sit fourth in Group F, four points behind second-placed Slovakia as they look to earn at least a play-off spot for Russia 2018. "When you're in possession of the ball, go and find out their weaknesses," Strachan explained. "Good players will decide games. "You can do a lot more on the defensive side, but you have to give the attacking players freedom. "We'll make sure we have a nice shape when we lose the ball but a freedom to play when we have it and let good players express themselves. "We haven't spoken about Malta yet and we won't until that game [on Friday] is finished." Celtic midfielder Callum McGregor was not included in Strachan's squad, but club-mates Craig Gordon, Kieran Tierney, Stuart Armstrong, Scott Brown, James Forrest and Leigh Griffiths were selected. The Scottish champions have qualified for the group stage of the Champions League and Celtic manager Brendan Rodgers was surprised by McGregor's omission. "Was there a reaction? I live somewhere else," said Strachan when asked about the public response to not including uncapped McGregor. "[Brendan Rodgers] also said he respects my decision. "Does everybody [in Scotland] see every one of our players? Have they seen Barry Bannan playing this year, whose been the best player in midfield for the Championship? Have they seen Tom Cairney playing for Fulham? "I understand every manager wants their players [in the squad] because they're all proud of their players. "You could say the same about the Aberdeen players, different players, Jordan Rhodes, Charlie Adam, [Kevin] McDonald at Fulham, whose one of the best midfield players there; Ross Wallace at Sheffield Wednesday, I could go on here, Barrie McKay, I've seen Barrie in the last couple of weeks, he's done a lot of nice things. I saw George Boyd on Saturday, George has been doing well. "There's loads of players out there. But [managers] have to look at what type of players I need for that game. "Would you take some of my players from this squad to play in your team? That's part of the game. Most managers have been very understanding. "If you look at midfield, we have 15 players who could possibly be in this squad."